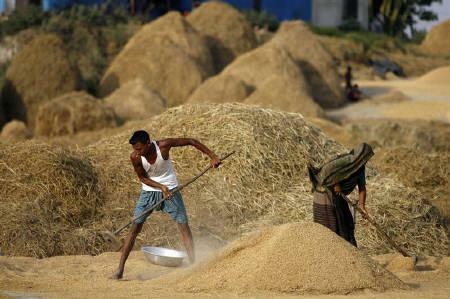 Economic Correspondent: Bangladesh has produced around 34.449 million tons of rice, basis milled, in FY 2013-14 (July - June), up about 2.7% from around 33.833 million tons produced in FY 2012-13, according to provisional official estimates from the Department of Agriculture Extension (DAE). According to the DAE data, Bangladesh produced around 19.1 million tons of rice from Boro (January - May), up about 2% from around 18.778 million tons produced last year. The country produced around 2.32 million tons of rice from Aus (February - July), up about 8% from around 2.15 million tons produced in the previous year. Bangladesh produced around 13.02 million tons of rice from Aman (April - December), up about 1% from around 12.897 million tons produced last year. Boro, Aus and Aman contribute to around 7%, 38% and 55% respectively to the total rice production in Bangladesh. Sources from DAE said that the average yield from the three crops in FY 2013-14 was at around 3.03 tons per hectare. They attribute the increase in rice production to the use of high-yielding variety seeds and government support to the rice sector in the form of subsidies in seeds, fertilizers and fuel. The Deputy Director of the DAE told local sources that the total rice production has surpassed the national demand. USDA estimates Bangladesh to produce around 34.8 million tons of rice in MY 2014-15 (May - April), up about 1% from an estimated 34.59 million tons in MY 2013-14. It estimates Bangladesh to import around 100,000 tons of rice in 2015, down about 75% from an estimated 400,000 tons in 2014. The country`s rice consumption needs are estimated at around 34.8 million tons in MY 2014-15 slightly up from an estimated 34.6 million tons in MY 2013-14.